SAN FRANCISCO — Frenetic aggression and elite racing was the order of the day for the youth sailors of the Red Bull Youth America’s Cup on Championship Wednesday — Sept. 4 — with New Zealand Sailing Team with Emirates Team New Zealand prevailing over nine other teams from around the world to take the inaugural title on San Francisco Bay. Red Bull Youth America’s Cup fleet races were held Sept. 1-4 out of America’s Cup Village at Marina Green. Teams composed of six sailors, ages 19-24 — representing their country through a nationality rule — competed in the same fast wing-sail AC45 catamarans used in America’s Cup World Series racing from 2011 to 2013. New Zealand Sailing Team was challenged early and often by its fierce rivals on Full Metal Jacket (also of New Zealand) and ROFF/Cascais Sailing Team from Portugal, who finished second and third, respectively. The leaderboard was tight throughout the regatta. The 10 youth teams, representing eight countries, pogoed up and down the points table, with each race result leading to tense moments on the final day. In the end, just three points separated second place from fifth place. When the Swiss Team won Race 7, they became the sixth different crew to claim a race win. 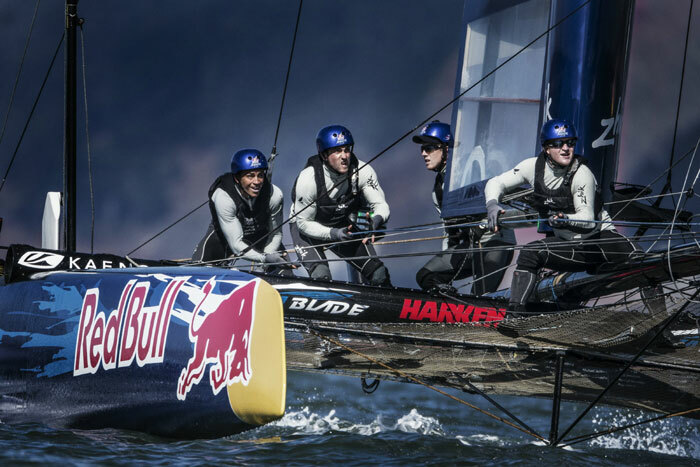 America’s Cup stars were on hand to watch this next generation of talent. Nathan Outteridge of Artemis and Glenn Ashby of America’s Cup Challenger Emirates Team New Zealand were impressed by how hard and fast these youth sailors pushed the AC45 catamarans. Swiss skipper Lucien Cujean had an outstanding start in Wednesday’s lone race and led all the way around the course, to jump from sixth place to fourth overall — just one point shy of the podium. The big winner on the day was ROFF/Cascais Sailing Team, who scored a second place to lift themselves onto the podium ahead of the Swiss and the American Youth Sailing Force — who had a disappointing eighth place finish, dropping from third to fifth overall. Roman Hagara and Hans-Peter Steinacher, the double Olympic Gold medalists who serve as sport directors of the Red Bull Youth America’s Cup, have been a driving force behind the event. They said they are quite impressed with the level of talent they’ve seen. One race was sailed on Wednesday, with strong winds whipping up San Francisco Bay — well outside the prescribed limit — and building further as the day progressed.